Some studies show that huge reductions in meat and dairy eating are essential to avoid dangerous climate change. I’m not vegan myself and I don’t think I will/could be (I rather believe we should eat and waste less food in general). But I love vegetables and fruit and I agree eating more veg and fruit centred diet benefits our wellbeing and our planet. 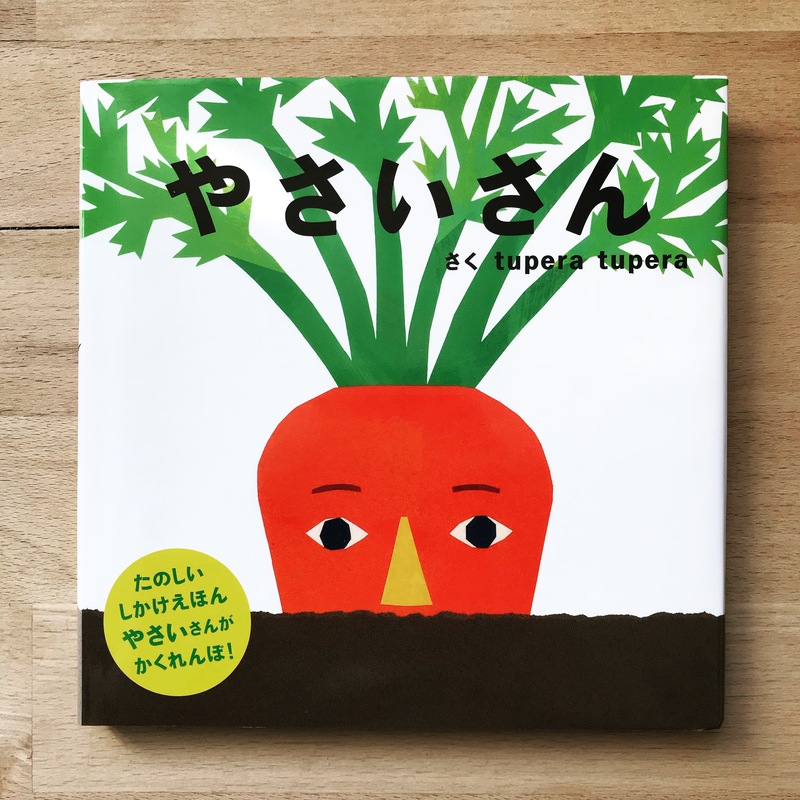 So, for November is the World Vegan Month, my pick this month is a Japanese, picture book featuring vegetables – やさいさん (Yasai San / ‘Vegetables’) by Tupera Tupera (Gakken 2010). Yasai San is a lift-the-flap book for young kids (1-3 yo). The format is very simple. On each spread, you see a top of a vegetable poking out from the earth and the text reads “Vegetable. Vegetable. Who are you?”, then you flip the flap to find out the answer – “POP. It’s a carrot.” This is a perfect book to read aloud with kids. The biggest charm of this book is undeniably the wonderfully quirky artwork by Japanese graphic design duo, Tupera Tupera (Tatsuya Kameyama and Atsuko Nakagawa). Their collage artwork is bold yet has beautiful texture, and the colours are delightful. And each vegetable has unique and characterful face. Their expressions are so whimsical and funny that make you laugh as soon as you flip the flaps. My favourite is the tough-looking, bearded potatoes. I could imagine kids would love the suspense to find what’s hiding and the funny artwork. I wouldn’t be surprised if this book could get kids interested in vegetables if not love them. Unfortunately, it seems this book isn’t available in English yet. However, the story is so simple (actually there’s no ‘story’). You could just enjoy the artwork, making up own stories. Or, alternatively, you could try other books by Tupera Tupera, like What Does Baby Want? (Phaidon) and Make Faces (Chronicle), which are equally fun and beautifully illustrated.